The Daily Activity screen shows the activity of a vehicle in within a 24 hour period (midnight to midnight) in the timezone of your organization. The report defaults to the current day, however previous days can be selected. Go to the Activity link > Vehicle tab, and click a vehicle name in the list. 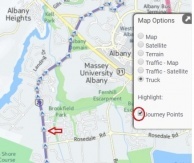 If the vehicle has current activity, the Daily Activity link is displayed below the map. Traffic information on any map in Depot reflects the current traffic flow. When going back in time, e.g. when viewing the Daily Activity Report for a previous date, traffic flow information (if displayed) for the current day and does not reflect traffic status of the selected time. Click the Tools menu, located at the upper right of the Depot page to download or setup to receive this report on a regular schedule. Click the Tools menu and select Export CSV. 1. Click the Tools menu and select Schedule this Report. 2. In the Schedule Report menu, enter a descriptive name or use the default. 3. Select a Delivery Frequency option. 4. In Active, select an option for how long you want to receive the report. 5. Click Add to begin regular report delivery. The Daily Activity screen allows you to view details of any exempt miles claimed ("off-road") and includes beginning and ending Ehubo readings, start and end location, latitude and longitudinal coordinates, and total exempt distance per exempt portion. Open the Map Options by clicking on the right upper corner of the Map. Detailed information will be displayed in the Map bubble. You can use the off-road tools to quickly and easily find and view off-road journeys for a particular day. Click the link next to the off-road distance to see the off-road journey details screen. This link is only available if off-road journeys have been completed during that day. Selecting the off-road journeys link will result in a list of all the off-road journeys for that day being displayed on the left side of the screen. Click the link in the off-road distance field to return to the Daily Activity screen. Click in the 'Config.' Column of the chosen event and the 'Change Trip Configuration' window will appear. Choose your configuration from the Configuration drop down list (if you select STP you also need to enter the Permit details). Select 'Onwards' if you want the system to automatically apply the chosen configuration from the selected event onwards. Select 'Select the finish point' to choose that last event in that configuration. Configurations can be changed both in real time and retrospectively. If your vehicles are traveling in the same configuration for an entire reporting period, you only need to set the configuration once. However, if a vehicle's configuration changes, you should change the configuration so that the correct tax rate is used for calculating taxes due.